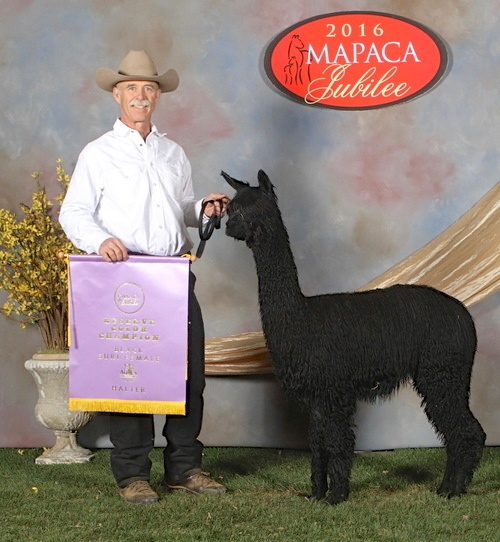 GLR Ali is a full sister to GLR Arappaho, now owned by Pines Edge Suri Alpacas and the 2009 MAPACA and AOBA Black Male Color Champion. She is a beautiful true black Shavano daughter from one of our favorite dams, GLR Allelujah, one of the only Synergy daughters we have ever kept. Her first dance in the show ring was at the 2010 AAA Futurity where she awarded Black Female Reserve Champion as a juvenile. She took first place and Black Female Color Champion at GWAS in Denver, the largest alpaca show in the nation and went on to earn the 2010 Reserve Black Female Color Champion at the AOBA Nationals in Ft. Wayne Indiana. She won Black Female Color Champion, and 2nd in Bred and Owned Female at the 2011 Mapaca Jubilee and she was Black Female Reserve Color Champion at the 2011 AAA Futurity and Black Reserve Color Champion at the 2011 GWAS show. 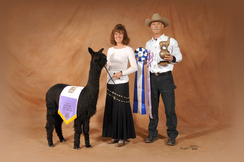 She also won the Black Female Color Championship at the 2011 Suri Network Fleece Show. She is a beautiful girl with great bone, excellent conformation, a lustrous greasy fleece, that desirable wedge shaped head and a sweet, mellow disposition to boot. 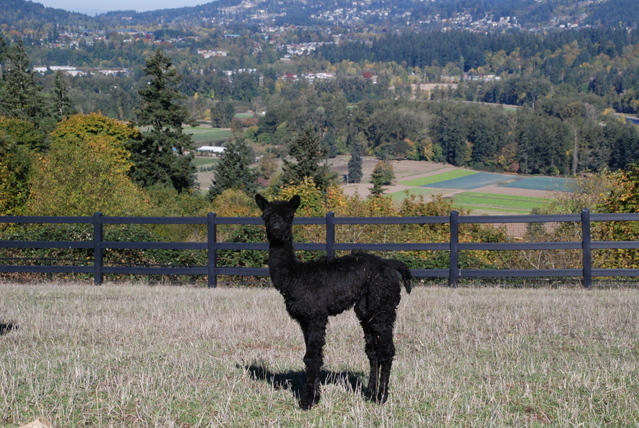 Ali's 2014 cria is a gorgeous true black daughter GLR Ongeleigh, sired by CInders, who Karl and Jan Heinrich, of Long Hollow Suri Alpacas purchased this fall. Ongeleigh is every bit as beautiful as her mother with incredible fleece, excellent luster, coverage and fineness, a great suri head , straight conformation and that sweet personality she inherited from her mom. We are honored by Karl and Jan's support of our breeding program with their purchase as they both are experts in evaluating and understanding suri fleece. We wish them luck in the show ring and can't wait to see Ongeleigh's cria when she retires to become a mom. Ali's 2015 female cria is yet another true black girl, GLR Alleycat who is just as promising as Ongelleigh and sired once again by Cinders who did well on the show circuit in 2016 in the top of the black juvenile classes and the 2016 Reserve Black Female at the 2016 Mapaca Jubilee. Alleycat ought to be a serious contender as a yearling in the show ring. Ali gave birth 2016 to yet another jet black male cria, GLR Alix. Ali gave birth to another beautiful true black female, Agatha, sired by 2016 & 2017 Herdsire of the Year, Cinders.